Has anyone seen those America swoops in when any mention of oil happens memes? 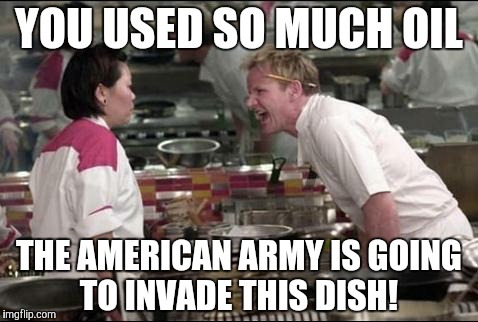 I saw one recently where a chef was adding vegetables in one panel, and in the next, he said oil, and murica was swooping up on him. The memes show how murica will find any way possible to meddle in the affairs of other countries when they have a valuable resource the US wants. There’s so much truth to these memes, but, is murica the big, bad evilist evil in the entire planet, or is America simply the product of success in civilization? These are the tales I will tell. The Murica oil memes, these memes are funny, but….as anyone who has ANY level of success knows, success requires continued success to continue. I mean, that might sound stupid because success is a word I used a LOT in that sentence, but let me break it down. Success (in this context, not universally) – Gathering influence and wealth. Continued success – You have to keep rising towards ever higher levels of influence and wealthage (technical term, DuckDuck it). This means you must beat back competition, and, when the influence is great enough, even nip it in the bud before it ever forms. The more influence you have, the more you are driven to increase that influence until you reach the pinnacle, which only a thin percentage of people so driven ever actually achieve. What you see below is not the product of an evil empire, but that natural result of a system that rewards those who seek the highest levels of influence and wealth they can possibly achieve. It’s not a capitalist problem, and it won’t be solved with socialism, it’s an imbalance of influence, which is power, and power is simply the ability to influence action, including your own. That imbalance of influence comes in the form of one sphere of influence that has fundamentally engineered the bulk of human socio-cultural expression for at least the last 2500 years (as far as ‘civilization’ being the main structure of human governance for a significant proportion of the population). The use of force to expand your influence, your wealth (which, no matter the core motivation, or who zoomed who, wealth and influence almost always go hand in hand). This is not a moralizing judgment but an observation of what is. And within that framework, the framework of ‘civilization,’ to expect anything else but various forms of concentrations of influence and wealth will occur over and over and over and over and over again is to deny the patterns of civilizing that lay before us over thousands of years. Those who are willing to send people to their deaths, or to order their deaths, must be deeply, deeply convicted, highly motivated, and have proven adept at doing such things for the ‘right’ cause just to get to the highest levels of influence and wealth in the land. Wherever force influence is the expander, the ones the most willing to kill will almost always rise to the top, with brief interludes of peace in between the warring seekers of the pinnacles of wealth and influence. These people, these people are essential, and profitable (to the right people), because they make the whole civilizing thing possible. You see, o one, ever, willingly, settles for subsistence, for death, for handing over their wealth, their lands, their resources, their markets, their mnonetary systems, etc. Even if they’ve found a space of relative comfort that gives them moments of joy, they are, yet, diminished in their capacity by the tacit and direct threat of violence upon them should they demand not to be treated as they are. With force-legitimizing authority behind it, the softener of the soul follows behind that threat- the use of deception and fraud to create icons that reinforce the legitimacy of the violence of the governing class. Now, with heroic tales, with nightmare stories, with compassionate narratives, with moral certainties, with outright concealment of fact and presentation of fabricated fact, the governing class ‘works’ to assure that the code, the civilizing code is transmitted to the governed classes. This code extends the threat of violence at deeper, more primal levels, weaving in myths of apocalyptic doom and liberating wars, so that the sociocultural landscape reinforce the violence in all ways possible, with love, with hate, with fear, with joy, with dazzle, and with gravitas. The landscape’s very structures, the buildings, the rooms, the walls, the bedside portrait of a governing class heroine, the marriage vows, the baseball games, ALL of them wind up festooned with the code, the civilizing code that reinforce the violence with fraud and deceit. To do anything else would be to not exist, and to be conquered, assimilated, by the next governing class, assuming, of course, the new bosses let you live. She is the product of the god your serve, the god of the civilized, in all its forms, the god that lifts up those who dare believe they and they alone should be allowed to control the resources, the wealth, the influence of millions upon millions of people who have been deeply conditioned to hardly resist the subservient roles you’ve created for them, the roles you’ve assured they’d keep in the code itself, which lives in the hearts, the minds, the drivers’ licenses, the daily purchase, of those same millions. The Murica Oil is peak civilization. You may not like it, but this is what peak civilization is.